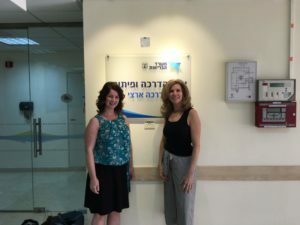 Professors Sasson and Embry at Tel Ha Shomer Hospital in Tel Aviv. Lisa Sasson is the dietetic internship director and a clinical professor in the Steinhardt School of in the Department of Nutrition and Food Studies Department. 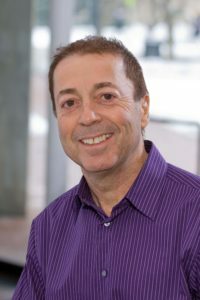 After directing the Nutrition and Food Study program at NYU Florence for many years, in May 2018 Professor Sasson directed the Nutrition and Food Study program at NYU Tel Aviv campus. During the January intersession Professor Sasson co-teaches an interdisciplinary course, Case-Based Management of Dysphagia (swallowing difficulty), with Erin Embry, a speech pathologist from Communicative Science Disorders. This course is designed to promote the development and application of interdisciplinary, collaborative approaches to evidence-based management of patients with complex needs. Through the use of case studies, student led discussions and learning exercises, students work as a team to review and critique treatment and management practices. Students also participate in a hands-on and interactive dysphagia cooking competition. A week before Professor’s Sasson’s departure for Tel Aviv, she received a call from a professor in speech pathology in Israel who saw a clip of the Dysphagia course on the internet and wanted to learn more about this class. There is growing interest in Israel interdisciplinary teaching. 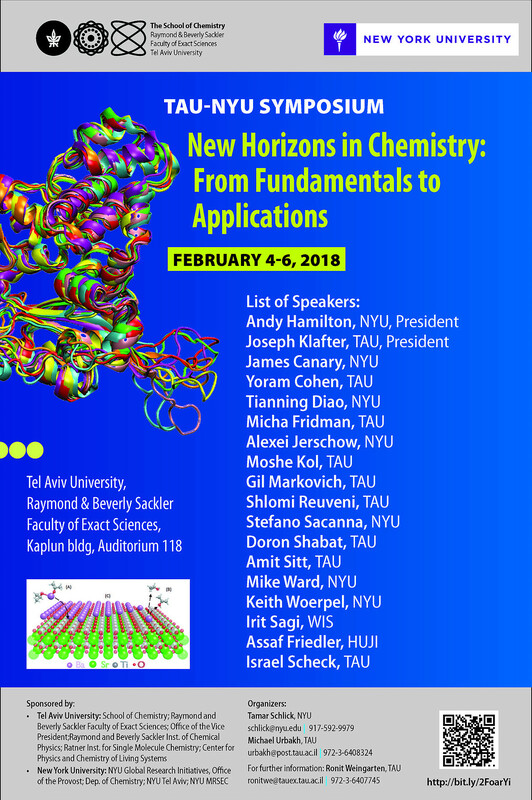 A couple of conference calls later, both Professor Sasson and Professor Embry were on their way to Israel to discuss this course in more detail and also explore possible future collaboration. Professor Sasson was on her way to Israel to prepare for the study abroad program but for Professor Embry it was her first time in Israel and she had only a few days to prepare for the trip! During their time in Israel, Professor Sasson and Professor Embry met with government representatives, NGO representatives, speech pathologists, occupational therapists, nutritionists, and hospital representatives. Professors Sasson and Embry learned so much about health care and treatment in Israel. 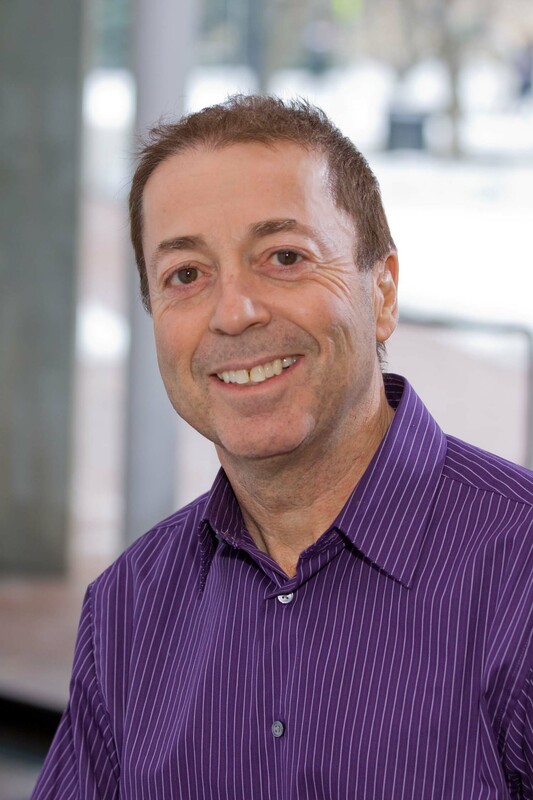 NYU Tel Aviv Director Benjamin Hary recently spoke to NPR. He contributed to the “The World in Words,” (NPR World Program) about Judeo-Arabic, which Professor Hary calls a “religiolect” because it is more than a dialect. Here is a link to the podcast. The program focuses on the unlikely story of the near-death and cultural revival of Judeo-Arabic. Professor Hary speaks about languages around minute three and comments on the politics of Arabic around minute ten. Zoya Teirstein studied at NYU Tel Aviv in the spring of 2016. 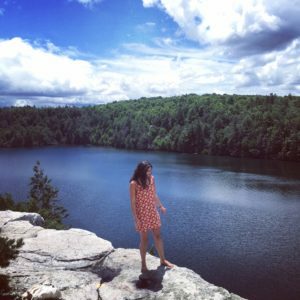 She managed two internships while there and shares her experiences with us. I am a senior at Gallatin concentrating in Environmental Reporting. I signed up for the NYU Tel Aviv program just in the nick of time. I was planning on doing a backpacking semester in California, but it fell through at the last minute and I chose to go to Israel instead kind of on a whim. I had been to Israel a few years earlier on a summer program and loved it, so that definitely factored into my decision. I was also interested in journalism and politics–Tel Aviv has a lot of both. The semester in California was supposed to be all about sustainability, which is the second component of my concentration. While I was excited about studying journalism in Tel Aviv, I was disappointed that I wouldn’t be able to immerse myself in environmental issues like I had planned. But I ended up interning for an environmental NGO and wound up learning a lot about what sustainability looks like in the Middle East. Tel Aviv is a lot like New York City in the sense that there’s always something going on. I was surprised how easy it was to feel comfortable there. When you move to a different place you expect to feel isolated, at least in the beginning. But that just wasn’t the case in Tel Aviv. Israelis are some of the most curious and friendly people, and I met interesting people almost every time I left the house. Unlike NYC, its sunny and warm almost every day, which is another incentive to go do things you wouldn’t normally do. I bought a used bike my first week there and used it to go to lectures at Tel Aviv University and find cool beaches, something I definitely wouldn’t be doing in New York in the middle of February. I understand that you interned with the Haaretz Daily and the Society for the Protection of Nature in Israel while at NYU Tel Aviv. Can you tell us about how you came to intern at both places? Were these academic internships or non-credit internships? I interned with Haaretz and SPNI during my semester in Tel Aviv, which took place in Spring 2016. 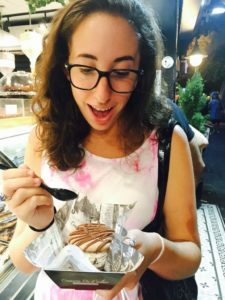 I found out about SPNI through Ilana Goldberg, who is the internship coordinator at NYU Tel Aviv and an amazing resource for people looking to intern abroad. I interviewed during my first couple weeks in Tel Aviv and started working there shortly after. Haaretz is Israel’s leading newspaper and getting an internship there is hard to do. Haaretz doesn’t advertise its internships on its website, and finding a contact at the newspaper who can set you up with an internship is difficult. Also, Haaretz normally finds interns through third party organizations, usually jewish groups that specialize in setting students up with long-term internships in Israel. The only reason I got that internship is because I went to a Haaretz event in NYC the previous semester and spoke to some Haaretz journalists who were willing to help me out. What did your work at each involve? How did you find the experiences? Both experiences were pretty amazing. Working at Haaretz was cool because its a major newspaper in a relatively small country that has breaking news events on a daily, if not hourly, basis. The Middle East is extremely volatile, and the newsroom would often have to drop everything to cover a developing crisis (this happened almost every time I went into work). During my first month at Haaretz, there were a string of stabbings in Jerusalem. It would be like 5 p.m. on a Thursday and just as most of our journalists were getting ready to leave for the weekend (Friday is not a work day in Israel) we’d get a report through the wires that there was another stabbing and everything would dissolve into chaos for 30 minutes. I was learning how to write breaking news headlines during this time, which was stressful and often really sad. I got to travel around Israel and interview water experts, environmental lawyers, and community activists. In America, an oil company might spill a few hundred thousand gallons of oil into a river and it can take years to get that company to pay for the damage it caused. Israel is much smaller than the United States, about the size of New Jersey, which means that when a community gets organized and tries to stop a corrupt company from exploiting natural resources, the federal government hears about it relatively quickly. This happened in the Judean lowlands, where a fracking company was stopped in its tracks by a coalition of informed civilians. I’d recommend interning at SPNI to almost anyone, regardless of how interested you are in saving the environment. Do you feel as though the work you did as an intern has been valuable? Has working for the Haaretz Daily changed your understanding of journalism? And has your work with the Society for the Protection of Nature in Israel influenced how you think about environmental issues? If so, can you describe how? Definitely. I had worked in a newsroom before going to Tel Aviv, but Haaretz is on a completely different playing field. Haaretz is considered far left of center, something a lot of Israeli’s don’t like. I learned early on not to tell people where I worked. An old lady yelled at me on the bus one time because she thought Haaretz was “tearing our country apart.” But I think the work they do is important. Unlike a lot of other newspapers in Israel, Haaretz covers issues on both sides of the conflict and gives precedence to newsworthy issues that have to do with Palestinian rights. America is just starting to confront the reality of a Trump presidency, but Israelis have been dealing with right-wing extremism for a long time. Benjamin Netanyahu, a proponent of settlement expansion, began his fourth term as Israel’s Prime Minister in 2015. Haaretz has been trying to hold him accountable since his first day in office. I also learned how much work goes into combating environmental degradation during my internship with SPNI. You’d think even the most money-hungry oil company would look at the Golan Heights, see its importance as an agricultural hub, its propensity for seismic activity, and the enormous reservoir right at its center, and stop to do an environmental impact report before blasting chemicals hundreds of meters into the ground. SPNI had to employ slews of experts, lawyers, and community leaders in its effort to combat Afek, and that’s just one campaign! I have a lot of appreciation for the work journalists and environmentalists do on a daily basis. 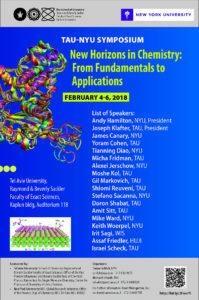 NYU Tel Aviv is amazing, but it’s insular. The campus is in the north, far from the busy center of the city, and there was a tendency, at least in my semester, to hang out on campus. If you chose to study abroad chances are you planned on doing more than drinking beers in the NYU Tel Aviv courtyard with the kids on your program. Getting an internship is a great way to get out of the bubble and see new things. It renewed my conviction to pursue environmental reporting, something I hope to pursue (maybe in Israel). 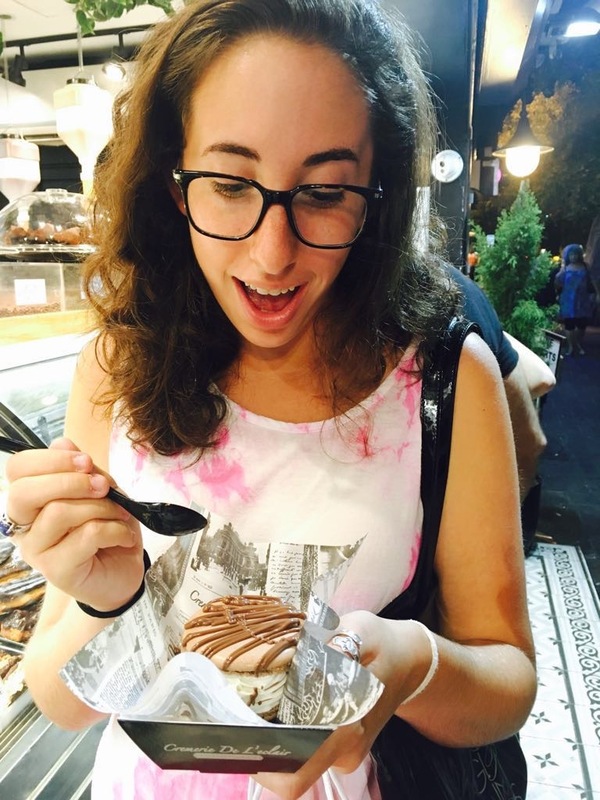 Marissa enjoying ice cream in Tel Aviv. Today we are in conversation with Marissa Adler, discussing her experience interning while at NYU Tel Aviv. 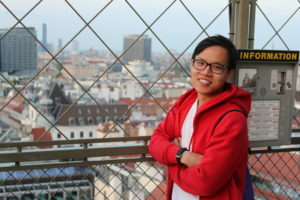 I am a junior in the College of Arts and Science, majoring in Politics. I think I always felt that if I was going to study abroad, it would be in Israel. Not only do I feel a religious connection (I’m Jewish), but I’ve been there a few times before, with family, friends, and school too. The only thing missing from those visits was the fact that I had never felt like I actually had the opportunity to live there. By spending 4 months there over the course of a semester, I felt like I had the opportunity to experience Israel not just as a visitor, but as an Israeli, which was really amazing for me. In short, my experience really was incredible. It might sound over the top, but honestly, there was something inspiring, surprising, and moving about every activity we did. NYU took us on amazing trips to Jerusalem, the North, the desert, and all over the country. I got to see gorgeous waterfalls while hiking the Israeli-Syrian border and then swim in a nature reserve in the Mediterranean in the North. But if I had to pick a specific moment that I know I will never forget, I think it would have to be the night of the holiday Yom Kippur. Yom Kippur is a fast day and one of the holiest days for Jews. In Israel, everything shuts down. No stores are open, no one drives, there’s nothing really on TV; everyone just spends time with friends and relatives. So that night, after I had come back from synagogue with my friends (some of whom weren’t Jewish and just wanted to experience the holiday), we decided to play cards because that doesn’t involve using electronics. We played cards long into the night, and then at around midnight, someone had an idea: “wait, there’s no cars guys, let’s play in the middle of the street!” So there we were, at midnight, sitting on a spare sheet, while kids rode by us on their bikes, laughing and playing cards in the middle of the street. I can’t tell you how amazing that was because it just made me feel like I was exactly where I belonged; I felt so at home. I understand that you interned with the Israel Religious Action Center while at NYU Tel Aviv. Can you tell us about the organization and how you came to intern there? Was this an academic internship or a non-credit internship? The Israel Religious Action Center started out as an arm of the United Reform Judaism organization and advocating for the Reform community in Israel. It was, and still is, difficult for Reform congregations to get recognized in Israel, so IRAC (our acronym) is there to support them. 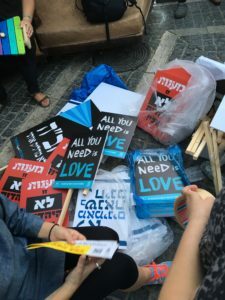 As the organization has progressed, their legal advocacy has expanded to other minority groups with a presence in Israel like the Israeli-Arab community, LGBTQ community, women, and several other groups. Our main goal was always, first and foremost, to obtain equality for all people living in Israel. I was fortunate enough to get this opportunity through Ilana Goldberg. She and I discussed my interests over the course of the summer, and she reached out to several organizations she thought would coincide best with my interests. When she suggested IRAC and advised me to research their work, I immediately knew that it was where I wanted to be. It was also a for-credit internship. Signs for the march against hatred that Marissa helped to organize while at IRAC. 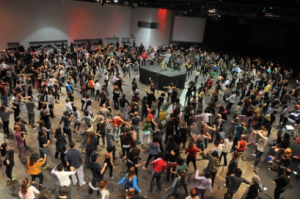 What did your work at IRAC involve? How did you find the experience? My primary work at IRAC was to research and develop a process by which a college student could create an on-campus group that is affiliated with IRAC. Throughout the course of the semester, I was in contact with several leaders of other groups (like Jstreet, Hillel boards, etc.) from a few universities in the North East. 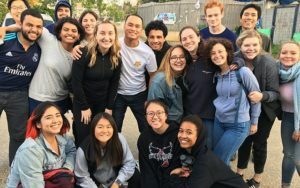 They advised and encouraged me to develop a plan that outlined my ideas for a potential group, and most importantly, how my group would be different from other social justice groups on campus. 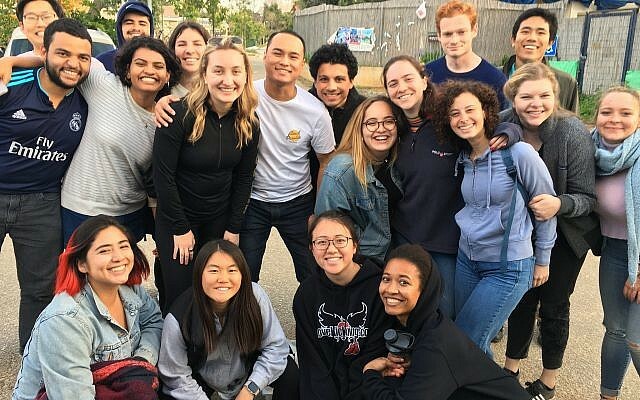 I also reached out to groups such as NFTY (North American Federation of Temple Youth), which is a youth group for the Reform movement, in order to gauge their reactions to a potential collaboration. Additionally, I did work around the office that required any additional help and was at the disposal of the Human Resource team. The experience was definitely life-changing. I realized how much one organization can accomplish in multiple areas of society. Though my primary work was to research the college group development process, there were days where I helped with other events like in the organization and implementation of a march against discrimination. I got to hear discussions about press releases, talk to attorneys in the legal arm of the organization, and just be a part of everything at the office. It was incredible to see how much of an impact IRAC could have in the community in Jerusalem and Israel at large. 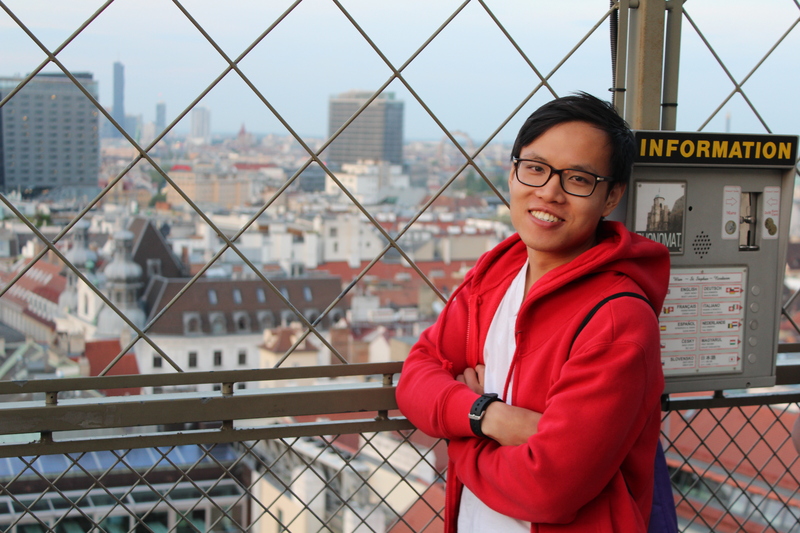 Do you feel as though the work you did as an intern was valuable and did you see its impact? I understand that IRAC is the public and legal advocacy arm of the Reform Movement in Israel and works to advance pluralism in Israeli society. Did the experience change your understanding of issues civil and human rights and the issues of religion and state in Israel? If so, can you describe how? I really do feel like my work had value and impact. In the immediate sense, I suppose I felt it when I helped with the march against hatred we did in October. In the long term, it was my research and the networks I established through the process of developing an outline of what an on-campus group affiliated with IRAC could look like. I also felt like I was having an impact just by being in the office, or maybe it was the office environment that was having an impact on me. I suppose it worked both ways, and for that, I am incredibly grateful. My work with IRAC definitely gave me a better understanding of civil and human rights issues in Israel. I was familiar with many of the current events and issues, but not in the way IRAC allowed me to be. I not only heard about certain issues, like threats from members of the Orthodox community made against members of the Reform movement at a congregation in Raanana, but I got to see how the organizations fighting these issues would react when these challenges arose. I knew about the Women of the Wall movement but I got to hear Enat Hoffman, one of the chairwomen, talk about dancing at the Western Wall with torahs and how significant that progress is for Jewish women. I felt more involved in what was and is going on than I ever had before, which was incredible for me. Well, while I was in Tel Aviv, two of the classes I took were politics classes. I took “Comparative Radical Politics,” and “Diplomacy and Negotiation.” While we talked about different political theories and beliefs in those classes, I got to see their implementation while I was in the office at IRAC. I knew the beliefs associated with the right and left in the Israeli political system, but by working at IRAC I saw how the policies were effecting the members of the population and the implications those policies had on the way IRAC conducted its work. So my academic work and my internship definitely had a tremendous sense of cohesion. Has your time studying at NYU Tel Aviv or interning at IRAC informed your thinking about your future plans? If so, how? I think it really affirmed for me that I need to work with people. Not just in a literal sense, but I need to be in a work environment where our goal is the betterment of different populations’ ways of life. There is so much that inhibits various groups of people around the world from living the way they want or even need to, and from my experience as a Jewish woman, I feel a connection with those groups. I want to help people, from a legal or perhaps non-profit perspective, work towards having the lives they want and deserve to live. I’m pretty sure law school is definitely part of my future at this point. I guess I can’t say enough how amazing it was. It allowed me to grow in so many ways, as a person, a Jew, a woman, and even more. I really want other people to experience Israel, regardless of their religion, because it is an incredible place that gives you a life changing spiritual experience. 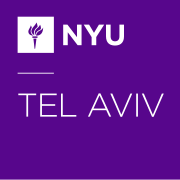 We are going to take a few posts to explore the internship experience at NYU Tel Aviv. To begin, we spoke with Ilana Goldberg, Internship Coordinator and Instructor at NYU Tel Aviv. She explained that the internship program was first created by Debra London, one of the people who set up the study away site at NYU Tel Aviv. Debra’s focus was on internships in non-profits and human rights organizations, but since then the program has expanded to include businesses, startups, think tanks, research centers, and art institutions. All the internships are unpaid and therefore come under the umbrella of NYU Tel Aviv’s academic activity, although students can choose whether to pursue the internship for credit or not. Students who wish to earn credit for their internships must enroll in the internship seminar, attend classes, and fulfill all the associated academic assignments. For the final paper, they undertake a small research project that brings an academic perspective to bear on some aspect of their placement and intern experience. To find suitable placements, Ilana begins with the applications that students submitted to the Office of Global studies. From this she learns about their college majors and declared interests. She then contacts students individually and requests updated resumes and sometimes also a writing sample or portfolio. In most cases she will also initiate a Skype interview, in order to get to know their personality a bit better, and help clarify and narrow down their interests. Based on the student’s interests, and academic and professional profile, Ilana tries to match them with organizations NYU Tel Aviv has worked with in the past or she reaches out to new organizations, in order to optimize the fit. The next step is making the connection between the student and the organization or company. At this point the student and recruiter at the organization take the lead and arrange an interview, and sometimes students will be asked to perform an assignment to evaluate their skills. The organization or company makes the final determination. Since some internships are very competitive, Ilana will sometimes refer students to two or more organizations simultaneously. In most cases, the matching process works extremely well, but sometimes placement sites want to wait to meet the student in person, and things are only finalized after arrival. For the uncommon event that a placement falls through in the last minute, Ilana tries to access additional backup options. The first weeks of the semester can be colored by a little uncertainty, and some patience is required until the student begins to adjust and feel comfortable at the placement. All the students in the internship program are offered continual support in dealing with workplace issues and dilemmas throughout the semester, both Ilana and the Assistant Director for Academics, Edan Raviv. 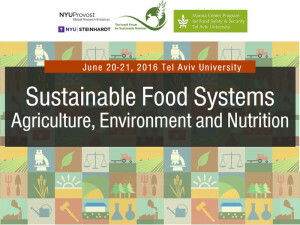 NYU Steinhardt Professor Lisa Sasson is helping to organize a Sustainable Food Systems conference at Tel Aviv University, Israel on 20-21 June. 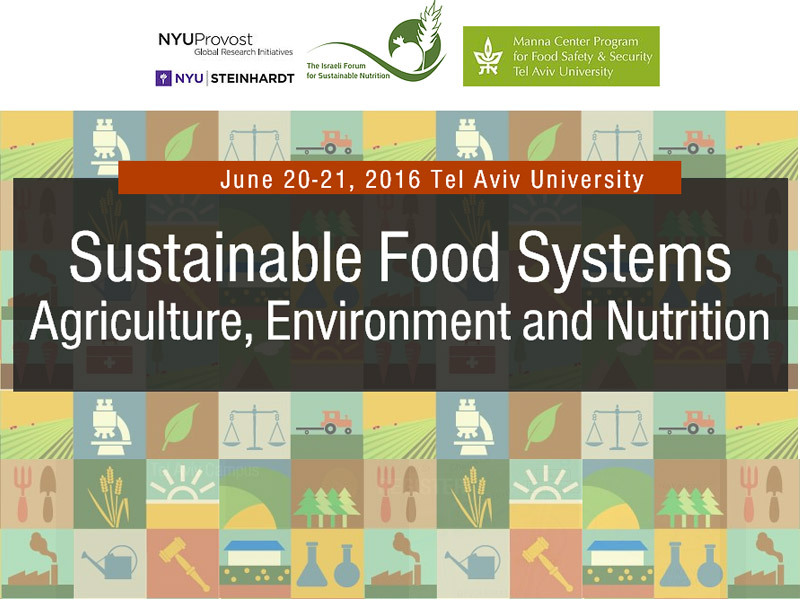 Sponsored by the Manna Center Program for Food Safety and Security at Tel Aviv University, the Israeli Forum for Sustainable Nutrition, and New York University, the conference will unite students and experts to discuss food safety, sustainability, nutrition, and public policy. NYU involvement and support includes participation from NYU Steinhardt, the Provost’s Global Research Initiatives program, and NYU Tel Aviv. The conference will enable participants to learn from and interact with renowned academic experts, government officials, industry leaders, and activists in the global and local food movement. Sustainable food systems takes into account environmental, health, social and economic concerns in the production and consumption of food. According to the Food and Agricultural Organization (FAO) of the UN, “Sustainable Diets are those diets with low environmental impacts which contribute to food and nutrition security and to healthy life for present and future generations. Sustainable diets are protective and respectful of biodiversity and ecosystems, culturally acceptable, accessible, economically fair and affordable; nutritionally adequate, safe and healthy; while optimizing natural and human resources”. Sustainable diets are the outcome of sustainable food systems. The aim of the conference is to draw on the themes of sustainability and food security, public policy, nutrition, and food justice, by bringing students and experts involved in these topics. The outcome will enable tackling the question of how best to integrate sustainability in our food system. Read more from the Israel Ministry of Foreign Affairs.